*the age where senior and geriatric periods start in dogs is highly variable. The senior period starts somewhere between 7 and 12 years as an average of all breeds, and the geriatric period starts when the pet begins dealing with the problems and diseases of old age, which both are dependent on your dog’s breed with much breed variation. The median age of toy poodles (where ½ have died) is reported at 14-15 years and the oldest dog on record officially in the Guinness book of records, is a Shiba Inu 26 years 9 months! As an approximation the average life span of small breeds is 16 years, medium breeds is 13.5 years, large breeds 12 years and giant breeds 9.5 years. Senior years being those in the last 25% of a particular dog’s predicted life span (American Animal Hospital Association). For Senior dogs, we should start considering twice yearly examinations, especially if there is any chronic illness we are treating or worried about. Geriatric dogs definitely should be evaluated at least twice yearly as things can change quite rapidly at this age. We have a checklist to make sure we cover all areas. You will need to book another appointment for behavioural problems due to time factors, but at this age typically there are only medical or senile problems to deal with. DHPP (distemper, hepatitis [Adenovirus], parvovirus, para-influenza) -all dogs. Core vaccine, but the most important aspect is for the vaccination against Parvovirus. L (Leptospirosis) – all dogs unless almost strictly indoors, with no contact to areas frequented by skunks and raccoons (contaminated soil/ water). R (Rabies) – required by law mainly to protect the public. This is a reportable, federally regulated disease that is lethal. It is also expensive to treat post rabies exposure in people. For senior or geriatric dogs our focus is generally off vaccinations, and on to more frequent wellness testing, other diagnostics, weight management and dental care. By this age we should be cycling vaccines well by now, such that we may be skipping more years and only giving one, or no injection each year. 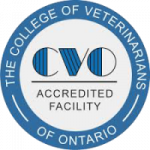 We believe at Beechwood Animal Hospital to tailor and balance the amount of vaccines given to a pet in relation to the risk the patient has in acquiring the illness, and the academic known or believed duration of action of a vaccine (rather than the labeled duration). As such we commonly prefer to cycle vaccines to 2- 3 years or more duration, once they have been properly boostered as a puppy and then re-boostered 1 year later. We prefer to cycle individual vaccines so they get as few vaccine injections as possible. This will require us to go off-label with the products if we have your consent. Some vaccines, like leptospirosis, have no solid efficacy data to prove the protection afforded by the vaccine lasts longer than 1 year, so we need to do this annually, or consider off-label use in certain situations/ lifestyles with the owner’s consent. We balance these decisions in conversation with the client in relation to exposure concerns, age factors and lifestyle. If vaccine induced antibodies have declined below protective levels, then protection, although delayed, comes from immunologic memory. It is general knowledge that the antibody duration and immunological memory developed with vaccines derived from bacteria (like leptospirosis, lymes and bordetella) is much less than from viral vaccines, and so these bacterial vaccines need more frequent vaccination boosters to stay within general accepted preventative beliefs. Long term duration studies are lacking though due to cost issues. For senior or geriatric dogs, we recommend checking the stools for parasites in December, or at the annual or biannual consultation, since the immune resistance to internal parasites can decline in this stage of life and re-infestation is routine in heavily soiled dog parks. If there is history of fleas, we need to treat for tapeworms regularly so long as we feel the dog is being bitten by adult fleas. This may be midway and at the end of flea treatment, and perhaps the following year. Flea eggs can remain dormant for many months, potentially as long as 6-12 months in cold conditions. For senior and geriatric dogs, we are often faced with growing dental problems, especially if we haven’t taken care of them regularly up until now. The problem now is that it is often not just preventative therapy. There are teeth to extract due to advancing periodontal disease, alveolar dental abscesses and bone resorption, slab or crown fractures, epuli, other growths and gingival hyperplasia. It is often not appreciated how chronically sore these pets’ mouths are. They sort of got used to it, or the signs were never appreciated. After extracting these bad teeth, that may be mobile or mal-aligned in the mouth, draining the abscesses after extracting the related tooth, and treating with antibiotics, these animals feel and act much happier. Clients notice then! This scenario is common and gratifying to see. Clients comment that I haven’t seen him/her this happy for years (sadly)! Unfortunately, these older dogs are at increased risks of potentially having anesthetic complications due to internal organ problems, weight problems, or just age related illness or degenerative health. Our veterinarians will make sure we evaluate for underlying problems by a thorough physical exam, history taking and appropriate wellness testing prior to any dental procedure or anesthesia. We may also suggest radiographic screening and/or ultrasound, especially if a heart murmur was detected or increased abdominal size making palpation difficult. In the senior and geriatric years the body’s organs are degenerating due to age, illness or genetic makeup. Our chances of catching these abnormalities on routine screening are more likely than at younger ages. Earlier blood screens if they hadn’t already picked up early tendencies or abnormalities, have provided a good baseline for assessing changes in blood values now. We advise doing wellness screening of your pet’s urine and blood once per year during the senior years, and more often if there are abnormalities we need to monitor. The urine check is often just for the urine concentration (USG) and quick chemical stick analysis unless there is some urination problem in the history. Bladder infections are common in dogs throughout their lives, but are more likely with advancing age, so we often do urinalysis and bladder cultures. Abdominal x-rays are sometimes needed to rule out stones, which commonly are related to recurring bladder infections or blood in the urine. Soon after entering this life stage, it is suggested you consider having screening radiographs (lateral chest and abdomen would suffice) taken mainly as a data base for future radiograph comparisons. If and when your dog has breathing problems, or begins to cough, it will provide a nice comparison for current views. Congestive Heart Failure, Chronic Obstructive Pulmonary Disease and pulmonary neoplasia is common in this age group. These screening radiographs provide a snap shot of internal organs, and the lungs in particular, to rule in or out abnormalities that won’t appear in blood work, and that your veterinarian can’t palpate. A newer screening suggestion in senior pets is blood pressure monitoring. The importance has been high-lighted in old cats. Now that we are screening more, we are finding more dogs with hypertension as well. This is manageable with medication(s). The blood screens (CBC, biochemical panels) give us a look inside the dog to see how the internal organs are doing. The CBC (complete blood count) evaluates the red blood cells, white blood cells and platelets, both in quantity, morphology and in the case of WBCs the relative and absolute numbers of the various types of WBCs (neutrophils, lymphocytes, monocytes, eosinophils, basophils). The biochemical panel measures a host of biochemical markers that are released, or accumulate, when certain specific organ systems aren’t functioning normally. For example, we look at the creatinine and urea nitrogen levels for kidney function, the ALT, ALP, GGT, bilirubin and AST levels for liver function. It’s not always black and white though, each one of these markers on their own can mean other things too. T4 levels are important to check in some dogs if unexplained obesity, poor hair coat and/or recurring skin infections occur, to name a few. SpecPLI assesses pancreatic function. The specific details on the importance of weight management, the illnesses and abnormalities that are associated with being overweight, the management strategies and charts to assess your canine friend, are all within the weight loss program of this website. For senior and geriatric pets being overweight (15% OW) or obese (>30%OW) can be quite debilitating, because the old bones and joints are going to have a lot harder job carrying the weight around. Being overweight predisposes pets to a number of illnesses, which are much more likely to occur the older the pet becomes. It is not too late to try to get these pets back into the normal weight range before the pet succumbs to one of these illnesses, or becomes debilitated simply due to excessive weight. During the annual or biannual consultation we will take a moment to assess your pet for his/ her body condition scores, (BCS- a score out of 5) and record its weight. Please make sure you help us remember to weigh your pet at each visit to the hospital, regardless of what reason. Weight loss is an important indicator of underlying disease or that you are doing a great job in solving a weight problem. Weight gain is a primary sign you may be overfeeding your dog, and maybe not providing enough activities to stimulate proper calorie consumption toward muscle building and fat burning. If weight loss is occurring we may encourage reassessing blood work and urinalysis. We’ll look more deeply into the past history for explanations most importantly. If weight gain is occurring, we will pay attention to the feeding pattern, nutrition and environmental enrichment factors. We will likely suggest a calorie restricted diet and changes in the feeding pattern to start a weight management strategy. We have a mini weight loss visit we suggest with our registered veterinary technicians to get you started on your own, or if the weight is serious (greater than 4+/5) we highly recommend entering our weight loss program which lasts 6-12 months depending on your pet’s individual requirements. This includes a rebound program to get your dog transitioned back onto a regular diet. Cognitive dysfunction is an abnormality that is being recognized more and more frequently by veterinarians as our loved ones live longer and longer lives. For our senior and geriatric patients, veterinarians specifically look for key indicators in the history to try and spot this problem. Classical abnormalities are disorientation, changes in interactions with people or other pets, alterations in sleep/ wake cycles, loss of house training (bowel movements or urination in the house), changes in activity (increased or decreased) and alterations in the pet’s learned behaviour or memory. There are some good responses to Selegiline which enhances dopamine and other catecholamines in the brain. Nutraceuticals such as SAMe are licenced for this purpose as well. There are a couple of diets that are backed with research to help improve pet’s brain function as well. We combine this important growing problem in our senior month which we focus on in November of each year. See Monthly Programs in this website.